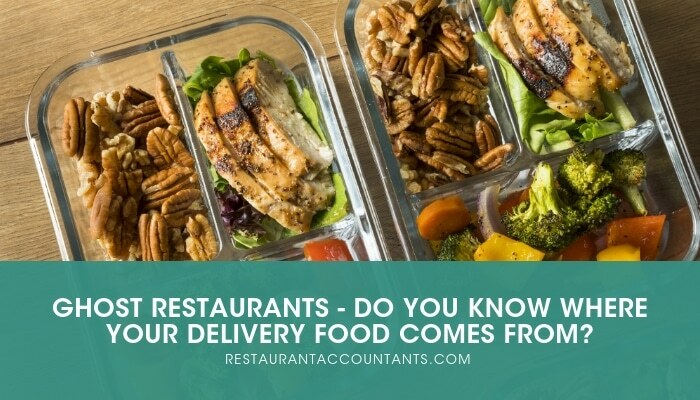 If you follow the restaurant and foodservice industry, you have likely noticed an increased demand for takeout and delivery. The addition of 3rd party delivery services simplifying the delivery process has been the major driving force behind the trend of adults, both young and old, enjoying a restaurant meal from the comfort of their own couch rather than a seat within the dining room. This has created several challenges for restauranteurs whose venues may not have been considered “delivery” restaurants. This sudden shift in the market has revealed a new space for these ghostly establishments. A “ghost restaurant” doesn’t carry a Halloween theme, and it isn’t intended to leave you scared. In fact, the term “ghost” is referring to the fact that you’re likely to never actually see or physically dine in a ghost restaurant, which is precisely the point. This concept isn’t a new idea, it is a modern solution that fits the needs of a growing market. It eliminates the high fixed costs of operating a standard brick and mortar restaurant. It cuts out the servers, the host, the tables, even the silverware, and caters exclusively to the growing number of people seeking a unique, quality meal delivered to their home or office. The same way that Amazon efficiently and effectively distributes many different products through a single virtual storefront, a shared ghost kitchen can accommodate multiple restaurant concepts within the same space, allowing operators to take advantage of sharing fixed costs like rent, utilities, and maintenance. In addition, they can avoid the costly labor that comes along with staffing a full or even quick-serve storefront. Location, arguably one of the most important factors for any conventional restaurant concept, is essentially irrelevant as long as you are close enough to your market to deliver a hot meal. What this does is allow restauranteurs and chefs to start a concept at a fraction of the cost, test and serve innovative dishes at a reasonable price, and when done correctly, can lead to an elevated dining experience delivered to wherever you may be. If you’re wondering whether your concept is right for a ghost restaurant, shared kitchen space, or in need of assistance with any operational or accounting concerns, please feel free to reach out to Derek Johnson at derek.johnson@krostcpas.com for a free consultation to explore how we can help guide your concept to success. ← KROST Quarterly: The Real Estate Issue Is Now Available!